My Christmas present to you this year is an addition to my free hardanger patterns. 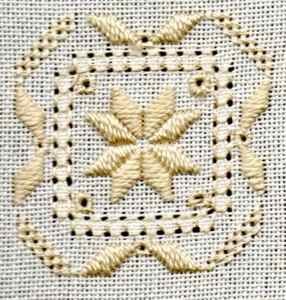 This quick to stitch hardanger design can be mounted in a card and given to someone special. Even a relative beginner could tackle this, as there is no cutting to be done! As with all of my free hardanger patterns, start by finding the centre of your fabric, and marking it with a glass headed pin. Pop your fabric into an embroidery hoop to make the stitching easier. Thread up with a longish length of the no. 5 thread (this is the thicker of the two) in either green or white. Following the chart, stitch the satin stitch star by counting up two threads from the centre and then working the top right diamond shape first. When you complete this shape, run the thread through the back of the stitches so that you are in the right position to stitch the adjoining shape. Work your way around the star in this manner. If you run short of thread, remember to finish a shape before rethreading. If you join in a new piece of thread in the middle of a shape it will show, as the old thread will be slightly worn and the new one still shiny. Next, thread up with the finer, no. 8 thread and work the four sided stitch around the central star. You can pull this tightly to produce a lacy effect or just leave the stitches at a normal tension, the choice is yours. 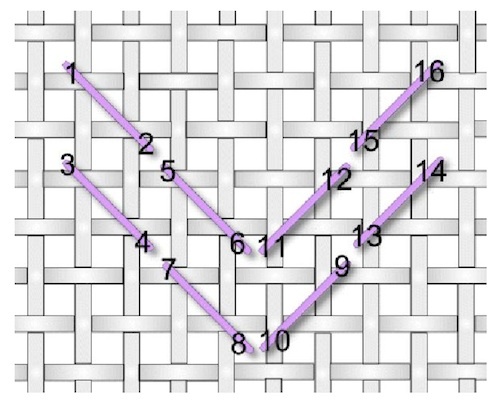 I love working four sided stitch and have on many an occasion got carried away and worked too many, so you may want to check the chart to make sure this doesn't happen to you. While you still have the fine thread in your needle, you can work the square eyelets in the corners and centre of the star. Pull these tightly to form a central hole. If you wanted to get fancy you could even stitch these in a gold metallic thread, but it isn't the easiest fiber to work with, be warned! Back to the thicker thread now for the satin stitch holly leaves around the outside. Then pop another eyelet in the centre of each group to represent a berry. All we have left to do is the cable stitches in each corner. These are worked in the finer thread and again, can be pulled tight if desired. Follow the diagram below noting that the centre row of holes will end up being used twice. With all the stitching complete the only thing left to do is mount your free hardanger patterns in cards ready to send off to your friends or family.